Business growth isn’t a finite goal; it’s an ongoing process, and it’s one that requires you to regularly evaluate how your business meets shifting demands in the market. With advancements in technology changing how buyers make purchases, it’s more important than ever to stay up-to-date on the latest sales strategies to give your business the boost it needs to succeed. Whether you’re just getting started or you’re an old hand, consider implementing these five tried-and-true sales strategies to grow your business. Integrating your sales and marketing teams can boost organizational growth by 5 to 36 percent, SiriusDecisions says. It’s clear that aligning your customer-facing teams has its benefits. Encouraging sales reps and marketers to collaboratewilldrive up your organization’s sales effectiveness and make your business competitive in an age where the buyer largely controls the buying process. When sales reps and marketers work together to provide the buyer with customized content that advances the deal, you ensure consistency in messaging from the top of the funnel right through to the person becoming a client. How do you get your sales reps and marketers on the same page? Require communicationby meeting regularly and sharing data-backed insights. Uniting your sellers and marketers around a common goal (strategy, goals, and metrics) will make both teams aware of their shared activities, challenges, and successes. Encourage collaborationin content development (with sales reps providing topics and marketers providing content), sales calls, marketing activities, and shared access to data-driven insights. Request evaluationof your sales and marketing drives. Tracking lead engagement levels, device viewing trends, sharing statistics, and download history helps sellers and marketers know what interests buyers. This, in turn, improves their lead-nurturing campaigns. 74 percent of buyerschoose to work withsales reps that are the first to add value and insightto help them navigate through each stage of the buying process. It’s important to provide content that compels buyers to act. Actionable– Convince clients to act and empower sales professionals to advance deals. Engaging – Interactive and useful to clients. Measurable– Easy to track and measure. Reusable– Usable across multiple channels and a wide range of media. Targetable– Address specific steps of the sales cycle, buyer needs,and pain points. Findable– Easy for yoursales force to find, digest, and utilize. Creating content that aligns with your buyer personas and maps to their buying journeyshelps sellers respond quickly to buyers’ needs with the right content at the right time. Measuring content performanceand collecting feedback helps further optimize content assets for continuedresults. Companies that use customer analytics enjoy 126 percent profit improvements over businesses that don’t. They also experience 131 percent sales improvements, a McKinsey reportshows. Using data and insights to anticipate market momentum, understand customer behavior, and make decisions can significantly boost growth. Running a business without customer analyticsis like operating a rudderless ship. Avoid running into the rough seas by tracking and using customer data to make key business decisions. Advanced analytics help businesses to build detailed customer profiles to predict which prospects to target, when to contact them, how to communicate with them, and what factors truly drive lead conversion rates. This is contrary to the use of gut instinct. This is a more scientific and reliable way to target customers. High-performing sales teamsuse almost three times as much technology as their low-performing counterparts. It’s a good idea to invest in sales technology to grow your bottom line. Investing in CRM(customer relationship management) software and other sales technology helps accelerate the sales process. A CRM system leads to organized data and better customer communication and satisfaction. For example, business intelligence solutions company Competitive Analytics wanted to better understand its sales pipeline and look at leads in a deeply analytical manner. It invested in Daylite CRMand is reaping the rewards of a more organized workflow and contact database. It also enjoys a structured process for lead nurturing and pushing out targeted content. Companies looking to align their sales and marketing teams are also investing in sales enablement. More than 40 percent of professionals reported an 11 percent boost in sales growth due to sales enablement. Sales enablement technology helps businesses provide personalized engagement to customers at scaleand equips sales reps with the right technology, processes, training, and content to advance deals and have more productive conversations with qualified leads. Organizations with robust sales training enjoy an average win rate of 58 percentwhile their opposites had an average win rate of 47 percent. It’s a good idea to make ongoing sales coaching a priority. The path to sales mastery is a never-ending one. It pays to coach both your star performers and the low-performing ones to improve sales results. Evaluating underperforming reps helps to determine where they need help, what issue to fix, gap to fill, or skill to develop. Evaluating successful reps also helps to identify what makes them tick. You can then look for the same qualities in new hires. with your star performers. Help them develop advanced skills while you assist underperforming reps by making your expectations clear, providing consistent feedback on performance gains and gaps, addressing lapses, and not assuming that performance will improve on its own. Your business needs to understand how sales reps really work to improve results. Treating your reps like customersby customizing outreach, tools, and techniques to the needs of different teams will go a long way in boosting your sales results. 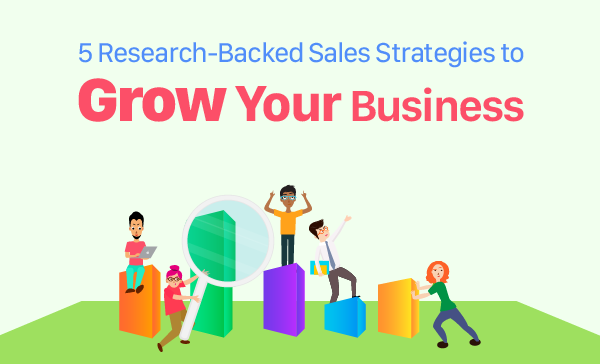 Scaling your business with these research-backed strategies takes the guesswork out of your growth efforts and provides a scientific and valid base for revenue improvement. With these five strategies, your teams will have the tools they need to meet buyers’ rising expectations and take your business to the next level. Mary Ade writes for Highspot, the industry’s most advanced sales enablement solution. You can follow Highspot on Twitter @Highspot.